Martina von Schwerin was an important contributor to the cultural scene at a time when women started to become an important cultural audience. Martina von Schwerin was the daughter of Martin Törngren, a director of the Swedish East India Company, and Lovisa Svartlock. She lost her father at an early age and was raised by her mother at Råda manor outside Gothenburg, where she gained a reasonable home education. She was able to read and write in several languages and, through corresponding with two relatives, namely Nils von Rosenstein, the first permanent secretary to the Swedish Academy, and the diplomat Carl Gustaf von Brinkman, she received a broad education on both the enlightenment and the romanticists. At the tender age of 16 she married the royal equerry Verner von Schwerin and settled first in Stockholm, and then, from 1812 onwards, at Sireköpinge manor in Scania. The majority of her days as lady of the manor were spent dealing with her children and household matters, but in the early mornings Martina von Schwerin dedicated time to reading and writing letters. Although she never published anything approximately 1000 of her letters have survived. These reveal that Martina von Schwerin did not just keep up with the latest literature in French, German, English and Swedish but that she also managed, with the help of her contacts, to facilitate her correspondent Esaias Tegnér’s entry into the Swedish Academy. The letters also show how she worked to promote Swedish belles-lettres at a time when very few original Swedish works of significant literary value were being published. During her youth she had written in French, but after 1825 she consciously chose to write in Swedish when corresponding with Tegnér. This was also true of her correspondence with Brinkman, with whom she otherwise socialised in French, as was the custom in noble circles. Martina von Schwerin read Lord Byron at a time when he was quite unknown in Sweden. She had found some of his poetry in a bookshop in Copenhagen in 1817 and immediately wrote to Brinkman about her find, which she described as an entirely new type of literature. The letters of Martina von Schwerin and her friends serve as newspapers of their time. They contain news, gossip, commentary, notices on this and that, and also lengthy opinion pieces on recently read books, in short competent literary criticism. Letters were only rarely treated as private matters, and were usually read out loud amongst friends, copied, forwarded and sometimes even inherited. 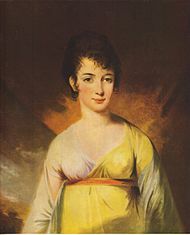 Martina von Schwerin’s skill in letter writing and literary opinion thus became known beyond her circle of acquaintances; when Atterbom passed through Scania on return from his journey to Europe in 1825 he complained that he never managed to visit “Baroness von Schwerin who was widely renowned for her belles-lettres and multiple talents”. Martina von Schwerin’s significance as an upholder of culture lies mainly in her way of reading. She differed from the modern voracious reader, often a passive consumer in a market where the supply determines demand, rather than vice versa. She had the self-esteem of the exclusive reader, seeing herself as an important co-creator and viewing reading as an active element of the literary process. Most of all she dared to be alone with her book, long before many other women. She asserted the right to read for herself, in both senses of the word, quietly and for her own benefit. Martina von Schwerin died in 1875. Martina von Schwerin, www.skbl.se/sv/artikel/MartinavonSchwerin, Svenskt kvinnobiografiskt lexikon (article by Ingrid Elam), retrieved 2019-04-20.